Numerous masses, with individuals up to 450lb, were found in a valley to the SW of Imilac, T.Allan, Trans. Roy. Soc. Edinburgh, 1831, 11, p.223, L.Fletcher, Min. Mag., 1889, 8, p.243. The specimen found in 1879 at Campo del Puchara, Argentina, was probably carried from Imilac, E.Cohen, Neues Jahrb. Min., 1887, 2, p.45, M.H.Hey, Cat. Met., 1966, p.212. Track study of olivine, L.L.Kashkarov et al, Meteoritika, 1972, 31, p.157. Coordinates, transported masses, strewn field, craters, metal deformation, V.F.Buchwald, Handbook of Iron Meteorites, Univ. of California, 1975, p.1393. Cooling rate and olivine composition, Fa12.3, P.R.Buseck and J.I.Goldstein, Bull. Geol. Soc. Amer., 1969, 80, p.2141. Analysis of metal, 9.9% Ni, 21.1 ppm Ga, 46.0 ppm Ge, 0.071 ppm Ir, J.T.Wasson and S.P.Sedwick, Nature, 1969, 222, p.22. 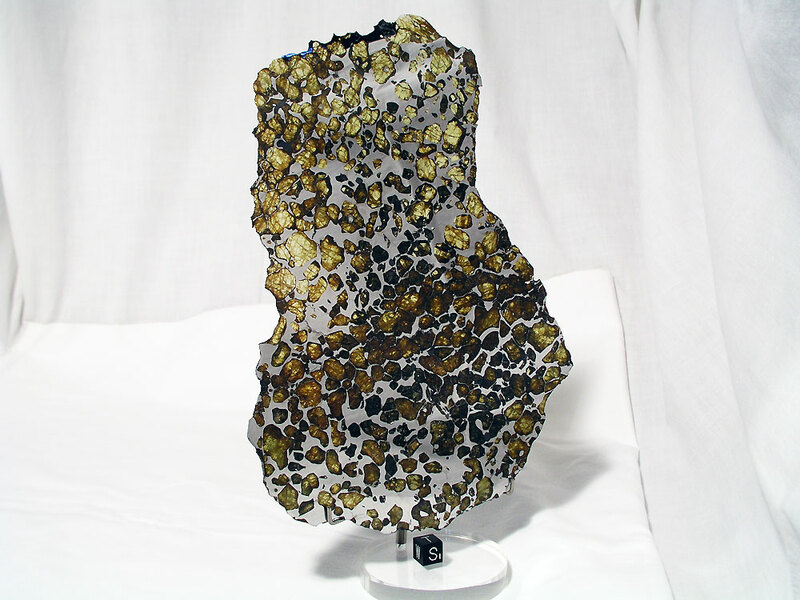 Classification and analysis of metal phase, main group pallasite, includes Antofagasta, Ilimaes, Ollague and Salta, E.R.D.Scott, GCA, 1977, 41, p.349. Study of olivine-metal texture, E.R.D.Scott, GCA, 1977, 41, p.693. Mineralogy and petrology, P.R.Busek, GCA, 1977, 41, p.711. Calculation of atmospheric ablation based on cosmic ray tracks and Ne isotopes, N.Bhandari et al., Nucl. Tracks, 1980, 4, p.213. Chemical composition of olivines, J.V.Smith et al., J. Geophys. Res., 1983, 88 (suppl. ), p.B229. Intrinsic oxygen fugacity of olivine in Salta, R.Brett and M.Sato, GCA, 1984, 48, p.111; see also, K.Righter et al., GCA, 1990, 54, p.1803; LPSC, 1989, 20, p.906 (abs.). References, A.L.Graham et al., Cat. Met., 1985, p.174. Three further masses found, 5kg, 19kg and 35kg, H.Pederson and F.Garcia, The Messenger (ESO), 1987, (no.47), p.1. Contains stanfieldite, crystal structure, I.M.Steele and E.Olsen, LPSC, 1992, 23, p.1355 (abs.). Reflectance spectra, comparison with olivine-rich asteroids, T.Hiroi et al., Proc. NIPR Symp. Ant. Met., 1993, (6), p.234. Reflectance spectra of olivine separates, E.A.Cloutis, LPSC, 1993, 24, p.317 (abs.). A large, 118kg mass was also found, R.Haag, priv. comm. to J.Koblitz, 1994. Be-10 and Al-26 data of silicate, H.Nagai et al., GCA, 1993, 57, p.3705; see also, Papers 15th Symp. Ant. Met., NIPR Tokyo, 1990, p.179 (abs.). Isotopic molecule mass compositions of nitrogen in olivine, N.Sugiura et al., Meteoritics, 1995, 30, p.646. Ar and Xe isotopic composition of silicate, Y.N.Miura et al., Papers 21st Symp. Ant. Met., NIPR Tokyo, 1996, p.119 (abs.). Cooling rate determination based on size of island region in cloudy zone of taenite, C.-W.Yang et al., MAPS, 1997, 32, p.423. Description of strewnfield; a H5 chondrite was found within the strewnfield, B.M.Killgore, LPSC, 1997, 28, p.725 (abs. ); see also, MAPS, 1997, 32, p.A71 (abs.) Study of metal phase microstructure formed at low temperatures, C.-W.Yang et al., GCA, 1997, 61, p.2943. Ru isotopic composition (for Salta), J.H.Chen et al., LPSC, 2003, 34, abs. #1789; see also, D.A.Papanastassiou et al., LPSC, 2004, 35, abs. #1828. REE abundances in phosphates, W.Hsu, MAPS, 2003, 38, No. 7 (Suppl. ), p.A11 (abs.). Study of minor element zoning and trace element composition of olivine and phosphates, W.Hsu, MAPS, 2003, 38, p.1217. Bulk and grain density, S.L.Wilkinson et al., MAPS, 2003, 38, p.1533. New chemical analysis, J.T.Wasson and B.-G.Choi, GCA, 2003, 67, p.3079. Fe isotopic composition, E.Mullane et al., MAPS, 2004, 39, No. 8 (Suppl. ), p.A74 (abs.). Hf-W dating of metal phase, G.Quitté et al., GCA, 2005, 69, p.1321. Trace element microanalysis of kamacite, taenite, troilite, and olivine, L.R.Danielson et al., MAPS, 2005, 40, No. 9 (Suppl. ), p.A35 (abs. ).